Great tour for people visiting Porto for the first time and with little time available, like us. Our tour guide was very knowledgeable of the area and history. The wine tasting was quick but very interesting. More than enough for what we wanted and a very good introduction before the tour of the Douro that we did the next day. Our guide Andre was very knowledgeable about the history of Porto which gave us a better understanding of the city and its culture. Very friendly - all in all an enjoyable half day tour which gave us all the highlights so we could go back to the places we really wanted to see. 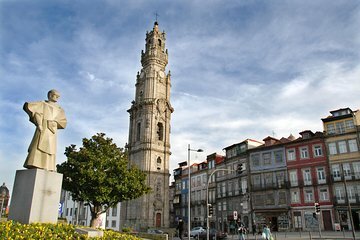 We booked a ½ day tour of Porto from our cruise ship for 9/14/17. Our guide, Andre, was waiting for the 4 of us at the port Leixoes, Portugal. He is a delightful young man. He was very flexible and showed us the sights we were interested in seeing. Our conversations helped direct our tour. Andre is very knowledgeable of the history of Porto and Portugal. He helped us to understand the rivalry between Porto and Lisbon and was able to answer all of our questions. I recommend asking for Andre to be your guide. You'll be in good hands.